Treatment for cancer patients has come a long way in the past 50 years. Surgery is more precise and less damaging; with early detection it can even cure some cancers including certain breast and colon cancers. Radiation therapy can be tailored to a patient’s tumor type, size and location, and can cure several early-stage cancers. And many patients now receive a specific combination of surgery and radiation, along with chemotherapy or other treatments, to increase survival. But when it comes to eliminating cancer as a deadly disease, much of the hope and funding lies in cancer drug discovery, the pace of which has been accelerating rapidly over time. 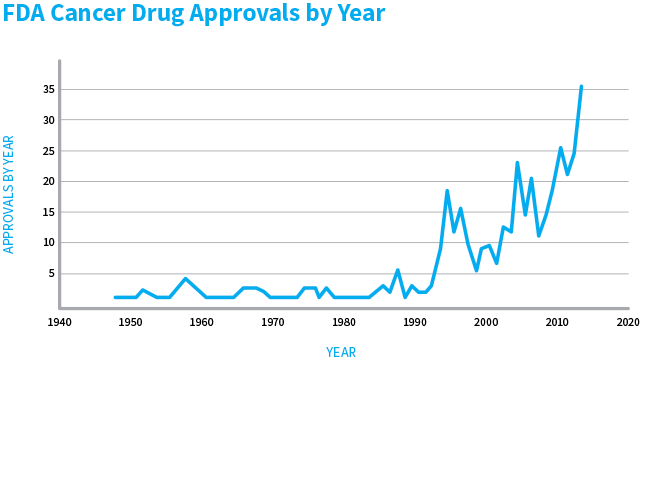 Graph depicts FDA cancer drug approvals from 1949 through 2016. Data are limited to new molecular entities (NMEs, as described by the FDA) and include approvals for additional indications when data was available. Also included are cancer diagnostic and surgery preparatory devices. Data compiled from drugs@fda.gov, National Cancer Institute, FDA Orange Book, FDA.gov, and centerwatch.com. Reporting and analysis by Sabrina Singleton, ACS research historian. Countless drug treatments are at various stages of development today. Some combine old therapies for new uses; others are entirely new types of drugs. Because we couldn’t possibly list a majority of the treatments on the horizon, we’ve selected just a few that show exciting promise to extend lives — and maybe even cure disease. Targeted therapy drugs attack a specific feature, or target, in cancer cells, and largely leave healthy cells alone. Today there are far more known targets than there are targeted treatments, but physician-scientist Wafik El-Deiry, MD, PhD, is helping to add one more targeted drug to the arsenal. ONC201, a small-molecule drug he discovered that is now being developed by a pharmaceutical company, is in clinical trials at major cancer centers. It’s showing early results in solid tumors as well as some blood cancers. Unlike many targeted therapies available today, which target a specific gene mutation that drives cancer, ONC201 “targets [features] of cancer cells that promote their survival, growth and metastasis,” El-Deiry explains. “It is a first-in-class anti-tumor agent,” meaning it treats disease with a new, unique mechanism. To describe its evolution requires condensing 20 years of El-Deiry’s work, which started with a simple question in the early 90s: How does the tumor suppressor gene p53 work? In a nutshell: p53 controls many genes inside cells, including one called death receptor 5 (which El-Deiry discovered), and another called TRAIL (TNF-related apoptosis-inducing ligand). When TRAIL activates death receptor 5, the latter signals tumor cells to die. But first TRAIL needs to be “turned on” by p53. It happens all the time in healthy people, but p53 is often damaged in cancer cells. “I decided to look for a way of turning on [TRAIL] in tumors, even if those tumors have lost p53 or have mutated p53,” says El-Deiry, an American Cancer Society research professor and deputy director of translational research at Fox Chase Cancer Center in Philadelphia. There’s a lot of buzz about immunotherapy, a class of drugs that harness the body’s immune system to attack cancer. Some cancer experts think the newer immunotherapy drugs may have potential to fight cancer more effectively and with fewer side effects than other treatment approaches — an idea that’s driving a major push to research and develop more. “There are [around] 800 immunotherapy trials out there. Every biotech company has its immunotherapy drug,” says Otis Brawley, MD, chief medical officer of ACS. One of the more recent and much talked about types of immunotherapy is called CAR (chimeric antigen receptor) T-cell therapy. With this type of treatment, immune cells called T-cells are removed from a patient’s blood, modified in the lab to attack malignant cells, and then returned to the body, where they seek and destroy cancer cells. Toward the end of 2016, dozens of CAR T-cell therapy clinical trials were under way. Jason Lohmueller, PhD, a postdoctoral fellow (funded by the ACS) at the University of Pittsburgh, is on a team that developed a CAR-T therapy targeting a protein called mucin-1, or MUC1. It’s currently in a clinical trial for colorectal cancer patients. However, Lohmueller notes that MUC1 is expressed on cells in more than 80% of human cancers — therefore, the drug he’s working on has the potential to treat multiple types. While many pharmaceutical companies and labs focus on developing the next big thing in cancer immunotherapy, other researchers work behind the scenes to advance basic science in this area. One crucial aspect of their work is understanding why some of today’s immunotherapy drugs aren’t effective in many patients. “We are completely focused on failure: why the up-and-coming immunotherapies do not help a major fraction of patients. Sometimes it may be the inherited genetics of the patient, sometimes the specific mutations in the tumor cells, and sometimes environmental factors,” says Thomas Gajewski, MD, PhD, a professor at the University of Chicago Medical Center. In the past few years, immunotherapy in particular has received hundreds of millions of dollars in public and private funding. In 2016 alone, the Parker Institute was formed, Johns Hopkins established the Bloomberg-Kimmel Institute for Cancer Immunotherapy, and Cancer Moonshot 2020, a collaboration of physicians and researchers, formed the Inflammatory Breast Cancer Working Group to identify and develop immunotherapy treatments. Not everyone thinks this much emphasis on immunotherapy is a good thing. Brawley is one of many concerned that it may overshadow and siphon off resources from other vital efforts to end the scourge of cancer, including other methods of treatment as well as prevention strategies. “One of my concerns about medical science, especially medical science for cancer, is these trends that happen over time. Everybody in the medical, scientific, and lay community runs in one direction for a while because something is very promising. Much support, perhaps too much support, goes in that particular arena,” Brawley says. He recounts how in the 1980s, tremendous investment went into chemotherapy — which we know is often beneficial, and can even cure some cancers, including testicular cancer and some leukemias and lymphomas. “But we pushed the research forward while ignoring other things,” he says, and notes the same thing happened in the 1990s with growth factor inhibitors. There’s so much else to be excited about in the field of cancer treatment beyond immunotherapy. The National Cancer Institute has an inspiring number of clinical trials for drugs and other treatment options, including surgery and radiation. You can search for one by type of cancer, phase of trial and other criteria here. And even these represent only a fraction of what’s in store. Sabrina Singleton, ACS research historian, contributed reporting.